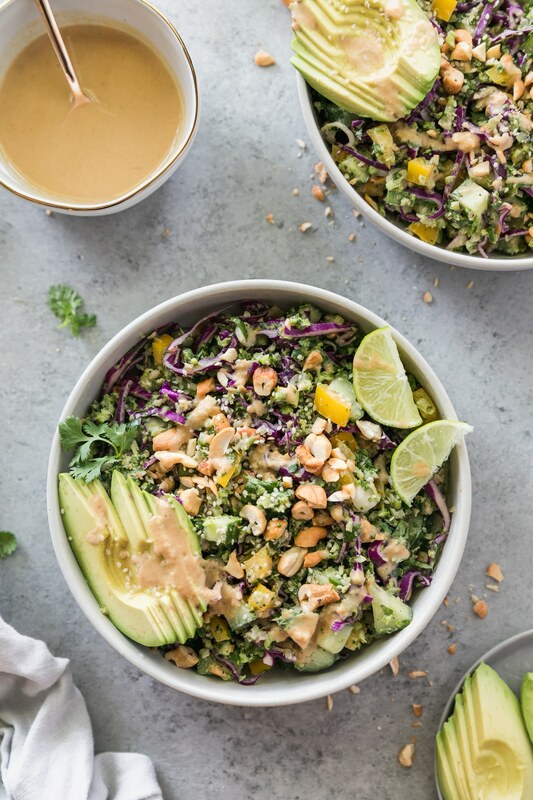 This Crunchy Thai Cashew Broccoli Rice Salad is filled with cucumbers, bell pepper, shredded red cabbage, scallions, broccoli rice, roasted cashews, and a cashew ginger lime dressing. It’s super crunchy, filled with tons of nutrients and healthy fats, and it’s great for easy lunches! Crunchy salads like these filled with TONS of texture are my absolute favorite. Really, anything with Thai flavors if we’re getting really specific. I know this isn’t traditional “Thai” by any means, but I really enjoy making my own takes on different ethnic foods and flavor profiles. It’s definitely no secret that I love texture in my food, and this salad is the epitome of texture. 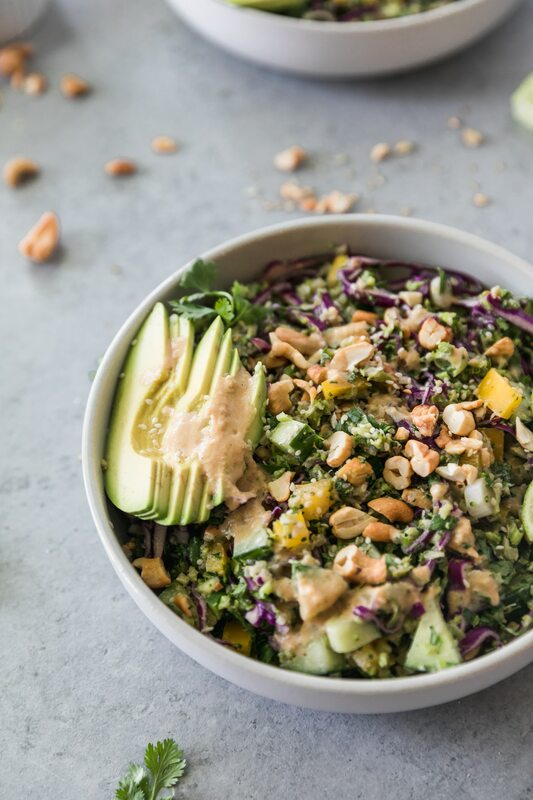 We’ve got crunch from the cashews, red cabbage, cucumber, and bell peppers, and lots of flavor from the fresh cilantro, scallions, and creamy cashew dressing. Major heart eyes over here. But quite possibly the most fun part of this salad, is the broccoli rice! 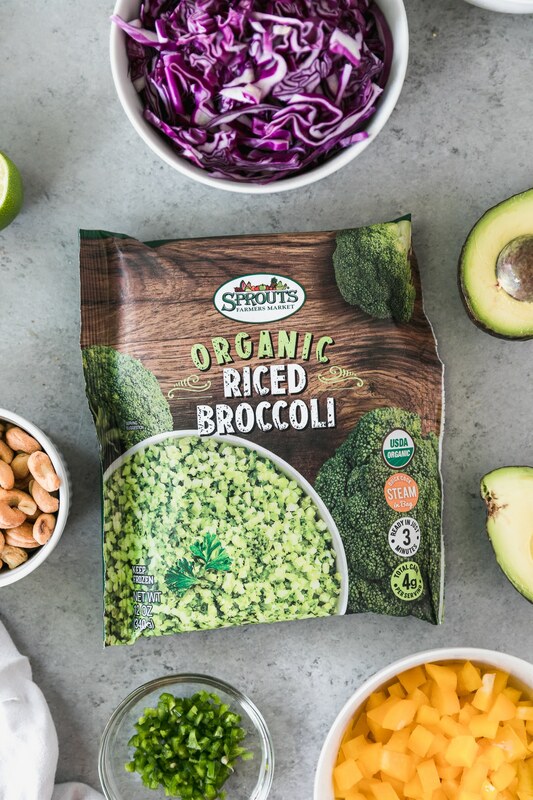 Sprouts is now carrying organic riced broccoli in the freezer section which I absolutely love. It’s so nice to have it at-the-ready for when I don’t have plans for dinner, but I want something healthy. I love eating it as a side, or throwing it into salads like this! I love cauliflower rice too, but I’m partial to the broccoli rice. 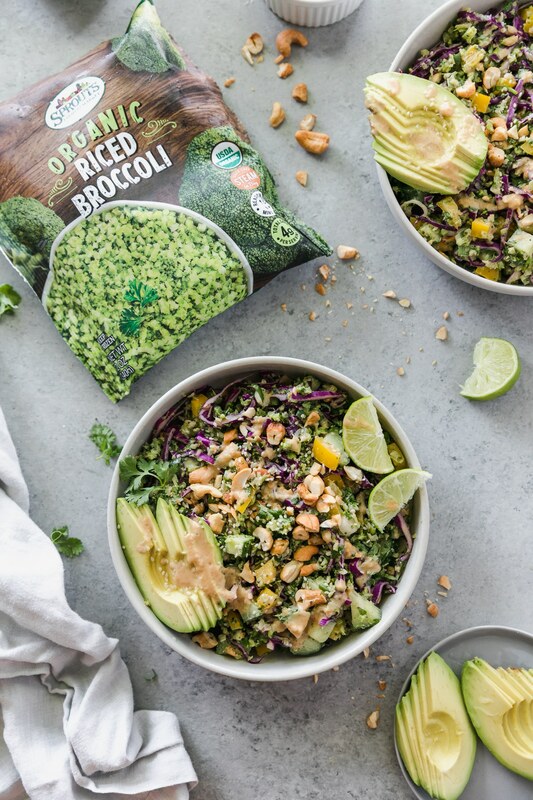 I love how Sprouts adds some of the greener parts of the broccoli florets, and not just the stems, which means more nutrients! I’ve just found that a lot of brands use just the stems, but I love getting extra green in when I can! And don’t even get me started on the dressing. It’s basically creamy cashew goodness filled with lime juice, rice wine vinegar, garlic, ginger, sesame oil, soy sauce, and honey, and it’s absolutely amazing. I like making and eating this salad the day of, just because I love the freshness and crunch it has, and after a day or so you don’t get as much of the crunch factor. That being said, I have eaten this a couple days after I’ve made it and it’s still been great! An easy way to freshen it up is to make fresh broccoli rice and toss it in, or chop up a couple handfuls of cilantro and toss that in! A little squeeze of lime wouldn’t hurt either! A little citrus and some herbs are always my go-to for everything. 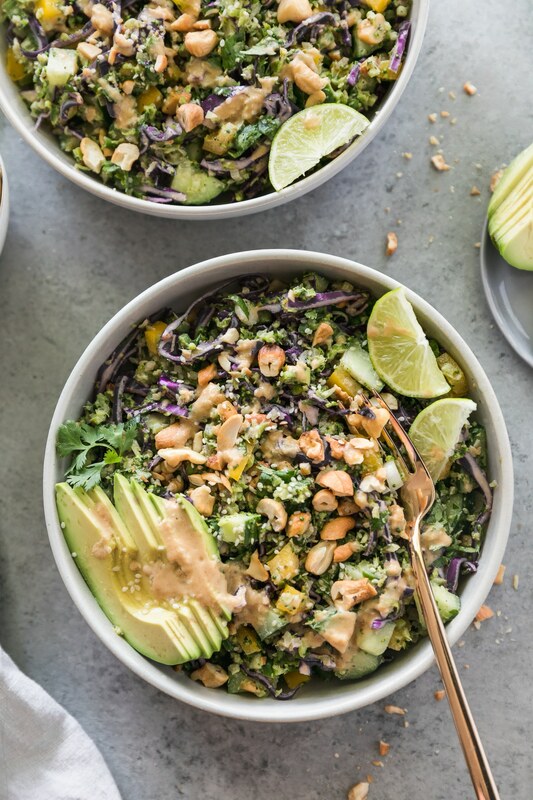 I love adding avocado on top, naturally, and a handful of chopped cashews! The best part, is that this takes 20 minutes to make. The most time consuming part is the chopping of the veggies. Which I actually find kind of therapeutic. I’m weird like that! Wanting this for lunch today! Heat a large skillet over medium-high heat. Add the coconut oil. Once melted, add the broccoli rice, salt, and pepper, and sauté for 3-4 minutes or until heated through. Let cool. Make the dressing. 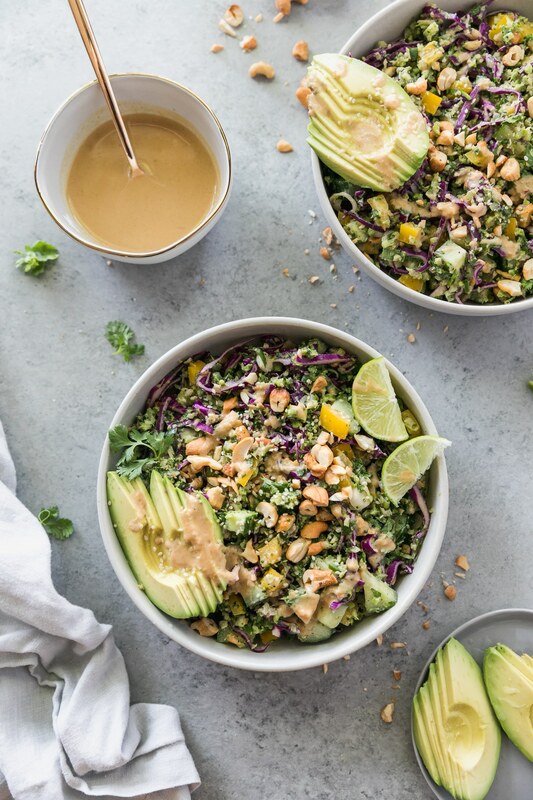 In a medium bowl, combine the cashew butter, lime juice, rice wine vinegar, soy sauce, sesame oil, ginger, garlic, and honey and whisk to combine. Once combined, add the hot water and whisk until completely smooth and creamy. 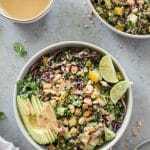 Once broccoli rice has cooled, in a large bowl, combine the red cabbage, bell pepper, cucumber, scallions, and cilantro. Stir to combine. Add the broccoli rice and stir again to combine. Add desired amount of dressing and stir to coat. 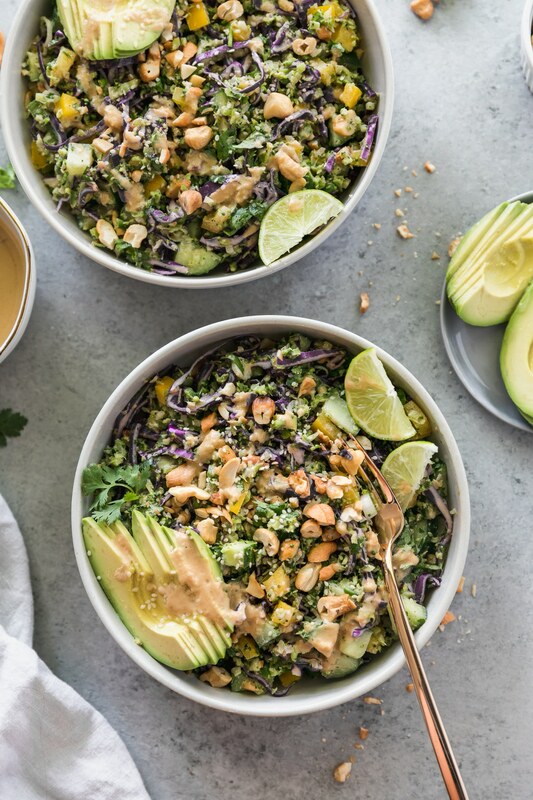 Portion into bowls and top with extra dressing, chopped cilantro, chopped cashews ,lime wedges, and a sprinkle of sesame seeds. Enjoy! I stumbled upon your site yesterday. I bookmarked this recipe and decided to try it. I took a chance buying ingredients I didn’t have and a blog I wasn’t familiar with. I’m so glad that I did. You have an excellent thing going. Incredible recipe – thank you! This salad is so good! 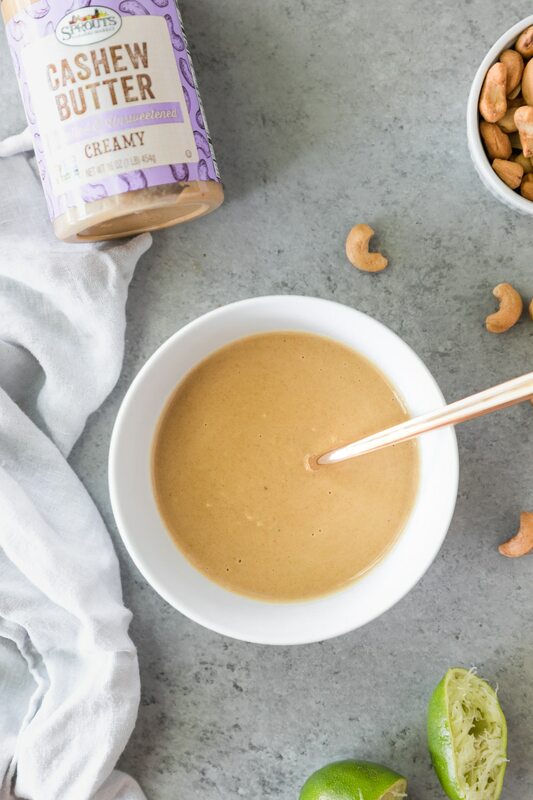 I swapped the cashew butter and cashews for peanut butter and peanuts (just what I had on hand) and it is definitely going into my regular lunch rotation! Looks yummy! Where can I find the nutrients breakdown for this salad please? Thanks Stacey! I don’t calculate nutrition breakdown for my recipes, but there are a bunch of free ones online where you can plug in the ingredients!